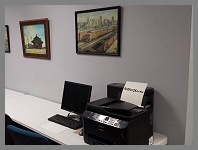 WESTERN NEW YORK RAILWAY HISTORICAL SOCIETY ARCHIVE COLLECTIONS - As we continue to expand our archive collections and library, we now have over 6,000 square feet devoted to storing all the artifacts, books and photographs in our collection. The Buffalo Irish Genealogy Society, "BIGS" has made public an index of over 4,500 employees that they have compiled from the archives of the WNYRHS. Click the link below to view the index and see if you can find any relatives. If you would like a detailed report about an employee that appears in the database, BIGS will be glad to do the research for you by using their "Railroad Employee Cards & Records" request form here. Notes may list changes or discrepancies of dates and/or names or other various personal information. BIGS is now working on records from the Erie Railroad. They have entered over 30,000 railroad employees into our database and are working on adding another 20,000. 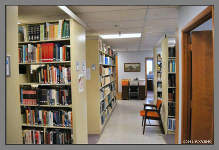 We have erected more shelving in the library and now have maxed out our space. We had to take half the space from our conference room to house all our new collections. 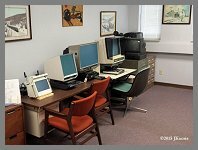 We would like to thank Fillmore District Councilman David Franczyk for a $3,000 grant to purchase additional computers, large screen monitors and supplies for the library. Thanks to Ed Patton for spearheading and securing the grant. 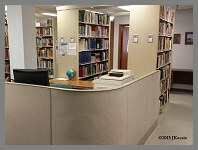 The library holds the collections of the Western New York Railway Historical Society, The Steel Plant Museum of Western New York, and The Buffalo Irish Genealogical Society. The public is welcome to come and request the use of our very large collection on Tuesday, Thursday and Saturday. Click here for an in depth description of Our Research Library written by BIGS and WNYRHS member, Ed Patton. All Donations to the Heritage Discovery Center are Tax-Deductable! The WNYHDC, Inc. 100 Lee Street, Buffalo, NY. 14210, is an independent organization and has no affiliation with any other local or national group.